In 2012 I left the corporate world and began my adventure into entrepreneurship. Not knowing which online tools to choose, I “Googled” for solutions. There were close to 1 billion answers! And many a shiny new solution. At some point, I landed in Martin Shervington’s Google Plus Community, “Plus Your Business”. I began following the trusted leaders in the PYB community. I read their posts, articles and blogs. I learned about everything from websites to social media to analytics. I tested tons of tools and methods. Lot's of mistakes later, I found the solutions that were simple and would grow with me. Here are seven reliable, inexpensive and easy to learn tools I recommend to new entrepreneurs. I hope they ease your journey! Domain names are the "online address" of your business. Google Domains are simple to set up. Fast and reliable connectivity with Google internet servers. Integrates easily with website platforms. Bonus: No confusing pressure to buy extra products and services you don’t need. Tip: Choose a domain name that is easy for people to remember and easy to spell. Google+ Profile - Auto created if you have a Google account. Look for the "+You" in the upper right hand corner. Google My Business Page - Storefront or an established service based business? Get your business on the map. Bonus: Manage your business from one simple dashboard. Tip: Add a nice professional picture and a good cover photo. Complete the “about’ section. Simple to use platform with clean designs. No coding experience necessary. Suitable for most businesses from bloggers to e-commerce. Cloud hosting included. Mobile friendly. Cost: $8 per month with room to grow as you do. Bonus: Integrates with Google Apps for Work, Google Domains and Getty Images. Tip: Squarespace provides a 10% discount code. Superior and comprehensive design tool for the rest of us. Pre-sized templates for most of your online marketing needs. Cost: Free to design. Many royalty free graphics and templates. $1 one-time use license for professional photographs & templates. Bonus: Design School - Free quick (less than 3:00 minutes) design lessons. Feel like a designer in no time! Tip: Read the blog for creative inspiration! 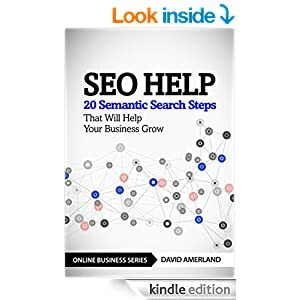 Easy to understand, no-nonsense book on how to approach digital marketing and search. This book will guide you down the right path for optimizing your online presence. You'll save tons of time and eliminate frustration and potential pitfalls. Get found on the internet. Verify your site. Diagnostics, tools and tips by Google for improving your search presence. Bonus: Google Webmasters hosts a free Hangout on Air for all levels. Important tool to help you understand your audience. Analyze marketing campaigns, test and re-market based on insights. Best of luck to you on your awesome endeavors! Start step by step and take breaks if you get overwhelmed. Let me know here if you need help or have other tools you find useful!